And of course, I have a theme poem, gifted to me by the always generous J. Patrick Lewis. As we prepare for National Poetry Month, let me share it here. It’s a lovely gem about books and the power of reading. As an attic’s shattered windowpane. Long after a day’s standardized test. Watch my blog for daily postings for April, National Poetry Month. And meanwhile, join the Poetry Friday Round Up at Cuentesitos. If you’re a regular Book Links subscriber, you may have already received your March issue. 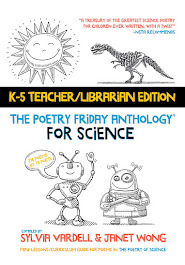 This time my “Everyday Poetry” column is focused on “’Doing’ Science with Poetry.” I’ve identified poetry books and activities for each of the seven categories of the National Science Education Standards for the curriculum, K-12. Here’s just an excerpt to whet your appetite. “At first glance it may seem odd to combine science and poetry, but they share one major attribute in common: the importance of keen observation. Poetry offers highly charged words and vivid imagery that tap the essence of a subject using sensory language. 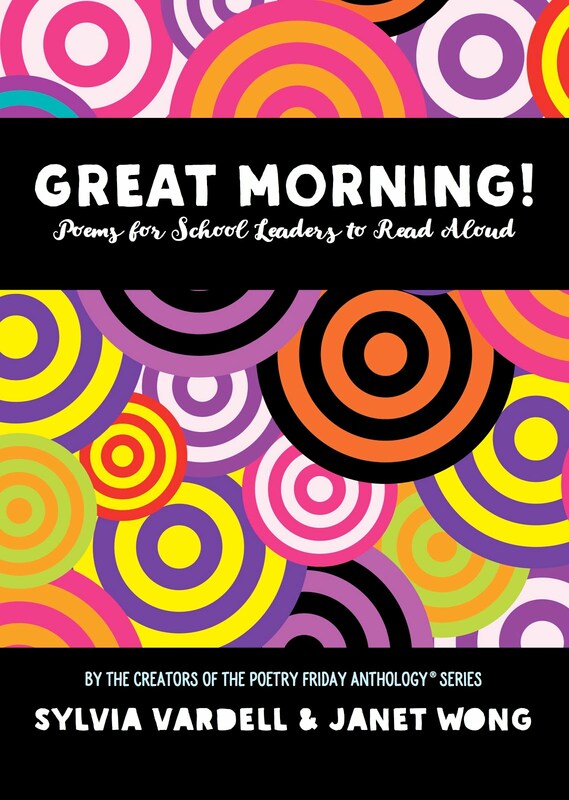 Poetry’s brevity, conceptual focus, and rich vocabulary make it a natural teaching tool for connecting with curricular content…. As we introduce children to physical science and the concepts of motion, matter, energy, atoms, light, heat, electricity, and magnetism, poetry can help pave the way. 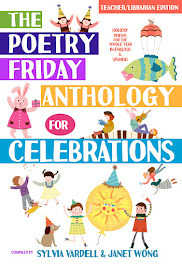 The rhyming shape poems of Flicker Flash by Joan Bransfield Graham explore the different ways that light appears in our world, from the flicker of birthday candles to a flash of lightning. Read them aloud by flashlight for added effect. A natural complement is Anna Grossnickle Hines poetry book, Winter Lights (Greenwillow 2005) or Marilyn Singer’s Central Heating: Poems About Fire and Warmth (Knopf 2005). Three of Jane Yolen’s poetry collections look at water in its varying forms: Once upon Ice and Other Frozen Poems (Boyds Mills Press 1997), Snow, Snow: Winter Poems for Children (Boyds Mills Press 1998) and Water Music: Poems for Children (Boyds Mills 1995), all illustrated with stunning photographs. For more “wet” poetry, consult Joan Bransfield Graham’s Splish Splash (Houghton Mifflin 2001), Constance Levy’s Splash! : Poems of Our Watery World (Orchard 2002), and Ralph Fletcher’s Water Planet: Poems about Water (Arrowhead, 1991). Many of these water poems lend themselves to reading aloud along with props such as soap bubbles, Christmas tree “icicles,” or audiotapes of waterfalls or the ocean surf. 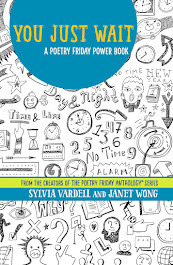 I’m also tickled to report that my previous Book Links article on “Pairing Poems Across Cultures” is now reprinted at PaperTigers as part of their March/April emphasis on poetry. 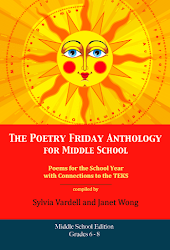 And for more poetry, check out the Poetry Friday Round Up at Wild Rose Reader. Here at the mid-point of March, I thought I’d pause to begin preparations for National Poetry Month, right around the corner. 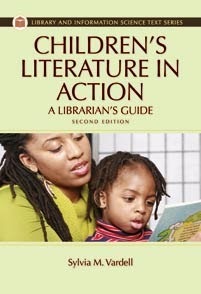 In addition, I got an email from ALA reminding me that National Library Week is also coming up (April 13-19). As I’ve shared before, I love putting these two topics together, hunting for poetry ABOUT the library. In my resource book, Poetry Aloud Here (ALA, 2006), I share a list of 10 library-poems, but the hunt continues and I’ve been finding even more, including this gem by Kathi Appelt. From Appelt, Kathi. 1997. Just People and Paper/Pen/Poem: A Young Writer’s Way to Begin. Spring, TX: Absey & Co.
3. Make a National Poetry Month Time Capsule. 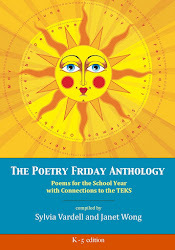 Students can submit favorite poems or their own original writing. 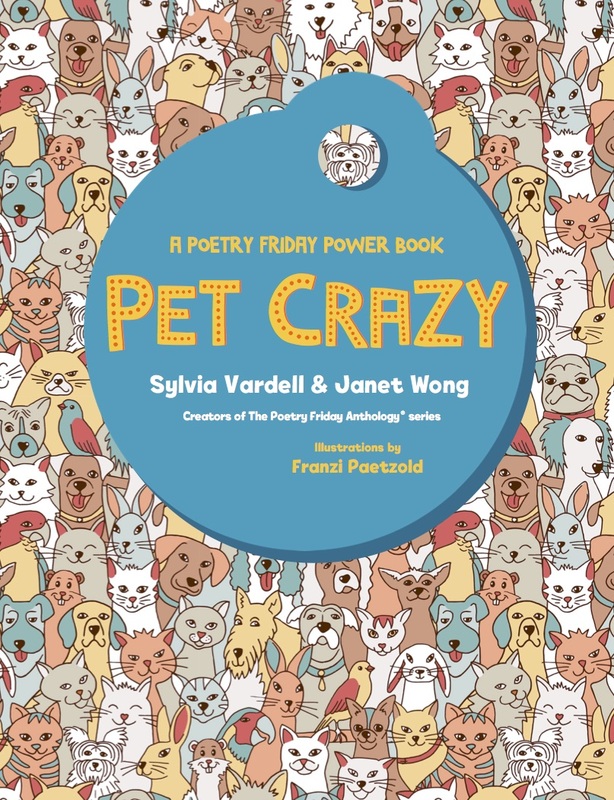 Put them in the Time Capsule and have a ceremonial sealing, not to be opened until National Poetry Month next year. 4. 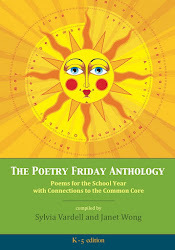 Send a poem to your state or local representative or other government official. For more on poetry, join the Poetry Friday Round Up at Jama Rattigan’s Alphabet Soup. Photo credit: The Beyond Words: Celebrating America's Libraries Photo Contest, which helped mark National Library Week 1999 and the Bicentennial of the Library of Congress. This is the week—some 42 years ago—that I became an American citizen. I was remembering the day fondly, and decided to make a poetry connection. I was 10 years old and my German-born parents were becoming naturalized citizens, so I was, too. I remember getting out of school, going to the Dallas courthouse, the seriousness and the celebration, and the chocolate milk shake that followed. What a day! A few years later, as a teenager, I helped my Oma (grandmother) master enough American history in broken English to pass the questions that were asked of her as she became an American citizen, too. This is the little old lady who stood up to Hitler and was a German refugee fleeing with five children and an elderly mother in tow. I am still touched when I see swearing in ceremonies and look at all the different faces that are proud to call the United States home. I know it may seem corny, but this is very real in my family. And there are many poets who have written about their feelings about this country, both good and bad. Maybe that’s why I love Langston Hughes and his “I, too am America” poem—although I recognize a very different struggle there. Or why I relate to Janet Wong’s poem, “Speak up” about kids taunting a child who speaks another language. 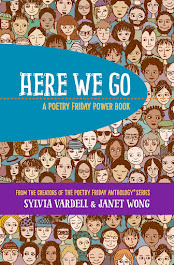 Many Latino/Latina poets have addressed this issue of immigration, language difference, and cultural assimilation in their work, including Pat Mora, Gary Soto, Juan Felipe Herrera, and Francisco X. Alarcón. One poetry collection that really speaks to me on this issue is Monica Gunning’s America, My New Home (San Francisco, CA: Children’s Book Press, 2004). Although Gunning is my mother’s age, and comes from Jamaica not Germany, her poems speak with wonder about the contrasts between her old home and new home, and about the challenges in straddling old ways and new, in ways that echo my own experiences and emotions. Across cultures, there are still children for whom “home” is a very real question, whose families talk seriously about loyalty and identity, and who walk the tightrope of keeping family traditions while being “real” Americans. 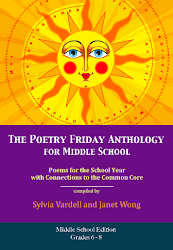 Join the rest of the Poetry Friday Round Up at The Simple and The Ordinary.